The fourth installment in the comedy adventure game series initially planned as a trilogy. however, under the pressure of fan expectations, the creators from Daedalic Entertainment decided to create one more entry in the franchise. 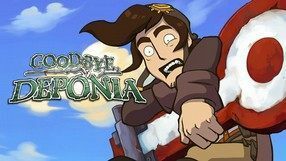 Deponia Doomsday continues the story of Rufus, who had a vision of a disaster striking the idyllic floating city of Elysium and his home, garbage heap-planet Deponia. Once he woke up from his nightmare, he decided to do everything he can in order to prevent the cataclysm from happening. He asks professor McChronicle for help and by using his time machine he sets out on a crazy journey in time and space. When it comes to gameplay mechanics, the game does not differ from the previous parts and concentrates on exploration, dialogues with NPCs, and puzzle solving. 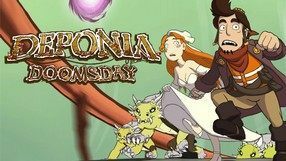 Even though Deponia Doomsday was released several years after the third part of the game, the visuals look very much the same, once again utilizing the series' distinctive style. The third installment in the acclaimed series of adventure games developed by Daedalic Entertainment focusing on the adventures of Rufus who comes from Deponia, the planet of trash. The game is a direct continuation to the previous entry in the series and the main character is still trying to save his planet from destruction. However, while in the previous game it was the beloved of Rufus whose personality was split, this time a similar thing happens to Rufus himself. As one can guess, it complicates the task at his hands, significantly. The gameplay mechanics did not change - once more it is a funny, cartoonish point-and-click adventure game in which the players spends most of the time solving riddles. However, Goodbye Deponia also allows us to see some of the characters in a new light. The sequel to the funny point-and-click adventure game developed by Daedalic Entertainment. The action of the game takes place on the planet Deponia, which is filled with various garbage. When the board that manages the giant flying city of Elysium decides to destroy that garbage dump, Rufus, the main protagonist of the first game, decides to put an end to their plans and save his home planet. However, in order to get to Elysium, the protagonist needs the codes that are hidden inside the head of his beloved one, Goal. When he tries to obtain them, the girl's psyche splits into three different personalities. In order to save the world, Rufus will have to once again conquer the heart of his beloved, which due to her current state will prove to be almost impossible. Gameplay mechanics of Chaos on Deponia don’t differ from the original game that was released few months earlier. The gameplay consists mostly of exploring, gathering items and solving riddles. A humoristic adventure game with a classic point-and-click interface. It was developed by Daedalic Entertainment, a studio that specializes in this genre. 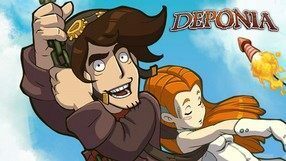 The story of Deponia can be described as one big comedy of errors and, at the same time, the most unbelievable love story ever shown in a video game. Fans of works by Douglas Adams, Terry Pratchett, and of The Simpsons animated TV series, will easily find it interesting. The title refers to a planet filled with heaps of garbage among which the main character, Rufus, lives. His greatest wish is to be rich and live someplace high, above the surface of the hated planet. Once upon a time, a beautiful girl, Goal, falls from the sky, and for Rufus it will mean the beginning of an extraordinary adventure that will quickly prove to be much more than a mission of walking a woman home. The story is shown using attractive, hand-drawn graphics, through which, among others, it provides a large dose of wacky humor.